The reviews and advice on this website are our own, independent and honest opinions based on carefully researched facts and personal observations. Everything on this site is written by us with no influence or oversight from manufacturers or retailers. We support this website using affiliate links. If you click on an affiliate link, then we may earn a small fee when you purchase that product online. Affiliate fees do NOT affect the price you pay. AirBedHub.com is a participant in the Amazon Services LLC Associates Program. This is an affiliate program which means we earn fees by advertising and linking to Amazon.com. Technological innovations have made it possible for you to ditch your old spring mattress for a newer option that will come in handy when you have guests over and even during a camping trip. Air beds have been slowly gaining popularity for being a cheaper alternative for achieving a good night’s rest without having to make a dent in your wallet. Keep reading for an in depth look at how air beds function and are the perfect mattress for you to rest your head on. 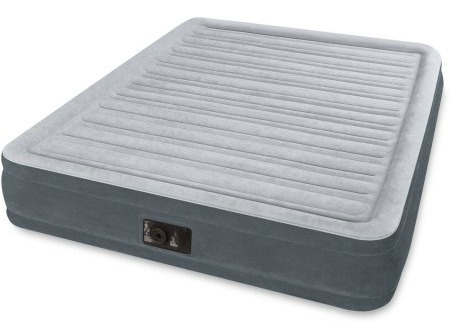 Air beds rank superior to spring and memory foam mattresses in regards to portability since you can place it on any solid ground and achieve a restful sleep. In fact, you can quickly inflate an air bed and use it anywhere in your home or even on camping trips. You can forget about using a sleeping bag when you have a luxury air bed ready for you to lay on at a moment's notice. Most air beds come with a pump whose function is to blow air into the mattress. When you’re done sleeping on an air bed, you can easily deflate and pack it away until you need to use it again. When compared to memory foam mattresses, air beds cost significantly lower. This makes air beds an ideal option when you don’t want to spend hundreds of dollars on a mattress that’s bound to give up on you within a couple of years. To give you a good idea as to how much air beds cost, a basic twin air mattress will cost you as little as $40. A memory foam mattress that can provide similar back support will cost you at least $500, which is a lot of money for a product that will sag after three years of use. If you plan on using an air bed as your primary mattress for in-home use, it's guaranteed to provide more support than a regular memory foam and spring mattress because you have the option to customize the air bed to your sleeping standards. Typically when you buy a spring or memory foam mattress, you need to specify the mattress firmness type, which ranges from a scale of 1 to 10. One on the scale would be a tough bed while ten would be an incredibly soft one. Your sleep position typically dictates the mattress firmness you should decide on. Buyers typically make the mistake of choosing a regular mattress with the incorrect firmness, so they end up with a mattress that doesn’t provide extra comfort and cannot be returned or exchanged. This means you’ll be stuck with a bed that you won’t even sleep on. When you buy an air bed, you don’t need to specify the mattress firmness since it allows you to customize the firmness to suit your sleeping needs. In fact, you can set an air bed as soft or as firm as you want it to be. This makes it ideal for when you have guests since they can inflate the mattress to their desired firmness level. When buying an air bed, you need to make sure you're choosing the right size for you to sleep comfortably on. For those who are sharing an air mattress with a partner, you should take into account your partner sleeping on the bed as well. Before you decide on an air bed, you are required to specify its weight capacity, so you'll know if it can hold either solely your weight or both you and your partner's weight combined. Keep in mind the location around your house in which you'll be putting the air bed in when you're not using it. Unfortunately, once you inflate an air bed you can't deflate it back into the box it came with, so make sure you have a designated area where you can safely store it. Whether it's for in-home or outdoor purposes, an air bed can be used in any environment. You can take it on a backpacking trip so you can sleep underneath the stars in ultimate comfort, or you can easily inflate it to fit your car's back seat, so you can take a quick snooze while you're on a road trip. An air bed is convenient to have at home in case you need an extra bed for when family members come to visit during the holidays. For those who live in an apartment, having a guest room is rare, so an air bed will function perfectly as a guest bed since you can set it up in the living room and allow your guest to enjoy a good night’s rest. Air beds consist of slightly different materials than memory foam mattresses, but some brands do combine elements from memory foam mattresses to create a highly comfortable air bed. Most air beds have a quilted top that makes up the bed’s exterior, and it functions to protect the air bladder from getting any holes. The air bladder is responsible for trapping the air, which is responsible for allowing the air bed to achieve its shape. The air bladder of an air bed is typically made of plastic, but the quality of the plastic depends on the brand you choose. Some manufacturers use more eco-friendly plastics while others utilize cheap plastic alternatives. You’ll notice that the most common material used to manufacture air beds is Polyvinyl Chloride or PVC. For those who are unfamiliar with polyvinyl chloride, the material is relatively cheap and readily available, which explains the low cost of air beds made of PVC. The PVC material used allows an air bed to be completely waterproof, which makes maintaining and cleaning an air bed a simple process. 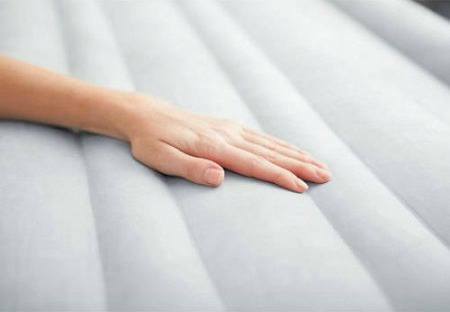 All you need is a damp yet soft piece of cloth to clean your air bed effectively. More importantly, the PVC is responsible for an air bed’s ability to not soak in any liquid. In case you accidentally spill your drink on an air bed, you don’t have to worry since it will slide right off, which makes an air bed an ideal mattress for everyday use. You also have the PVC to thank for in regards to your air bed's versatility since the material gives the air bed a lightweight and portable quality that attracts most buyers. 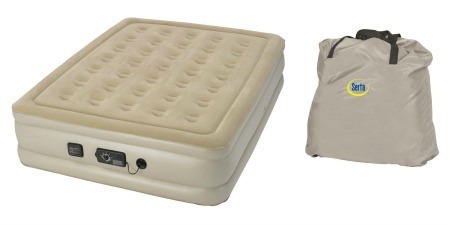 This makes air beds perfect for camping trips since you'll want to minimize your weight load for such an adventure. There are two pump options in regards to air beds so that you can choose between an external pump or an internal one. 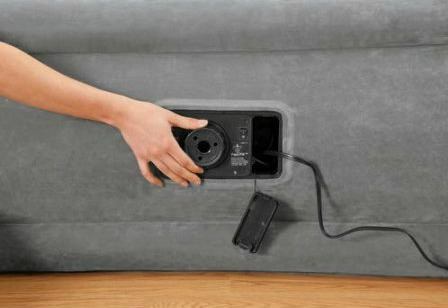 Built in pumps gives the user the ultimate control of adjusting the firmness level of the air bed with just the twist of a knob. These pumps are either powered by electricity or batteries, and you can expect your air bed to inflate at much faster rates when compared to an external pump. Air beds come in varying thickness so that you can choose between a raised air bed or a low profile one. For those who want an air bed to mimic the design of a traditional mattress closely, a raised air bed will suffice for your sleeping requirements. The raised air bed is specially designed to keep you as far away from the floor as possible, but it will take up a significant amount of space which makes storing it a hassle. A low profile air bed doesn’t inflate as high as a raised air bed, so you should expect to sleep close to the floor. These air beds cost less and can be easily stored away for future use. In fact, these air beds are ideal for camping trips since it deflates in seconds and you can easily roll it up and pack it into your backpack. Now that you have a thorough understanding of what to make a note of when you’re searching to find the perfect air bed, you should keep on reading for detailed reviews of air beds that are guaranteed to satisfy your mattress needs. For those who want an air bed that will ensure your guests experience the deepest sleep of their lives, Intex is the manufacturer you should trust. Intex has been manufacturing air mattresses for over 40 years, and in that time frame, it has introduced innovative technology to the mattress industry, which cemented Intex's spot as being a leader in air bed production. Most buyers always comment on how comfortable Intex Air Bed is to sleep on, and they have Intex patented Fiber-Tech technology to thank. If you were to open up your Intex Air Bed, you'd notice that its internal chambers are uniquely designed in a separated fashion. In fact, Intex air bed consist of thousands of exceptionally tough fibers that function to separate the inner chambers, which promotes stability throughout the mattress. The Fiber-Tech engineering is responsible for distributing weight evenly across the bed's surface, so it will never sag and last you decades before you need to buy another air bed. In regards to setting up Intex Air Bed, all you have to do is press a button, and the mattress will inflate to your firmness standard. Keep in mind that since this air bed costs less than $50, the built-in pump will function slightly slower and noisier than high-grade air beds, but it will get the job done. After a few test runs, Intex Air Bed will fully inflate within a time span of 4 minutes, but most users recommend inflating it for 3 minutes and 30 seconds for a comfortable firmness level. This makes Intex Air Bed the best twin air mattress money can buy you. For those who want an interactive air bed that best mimics the experience of sleeping on either a memory foam or a spring mattress for a fraction of the cost, Serta Neverflat Air Mattress will be your optimal choice. Serta has a long history with manufacturing and designing all types of mattresses, so it's no surprise that it produces one of the best-selling air beds on the mattress market. In fact, Serta Air Beds consist of never before seen technology that guarantees a good night's rest for either yourself or your guests. Serta Neverflat Air Mattress comes with Never Flat technology that functions to maintain the air bed’s pressure while you sleep, which effectively prevents sagging so you sleep on a well-balanced bed. 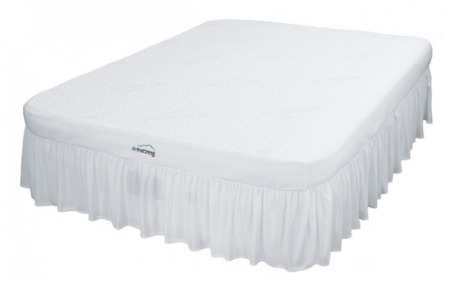 The Never Flat technology of this Serta Inflatable Mattress pertains to an automatic functioning yet silent pump that allows you to experience a night of continuous deep sleep. 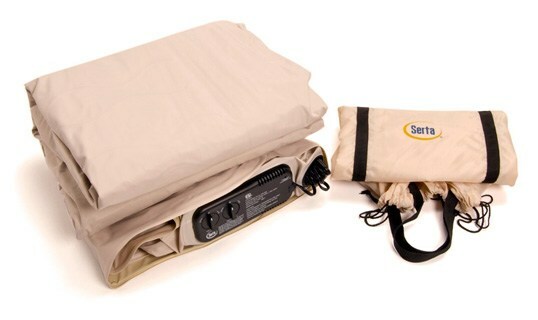 This Serta Air Bed comes with two pumps that each play a role in implementing Serta’s patented Never Flat technology. All that’s required from you is to choose your desired firmness level, which ranges from Plush to Medium to Firm. The primary pump will begin to inflate the bed once you designate your firmness level and will automatically shut off once it reaches that point. Once the air bed is fully inflated, the secondary pump that is designed with pressure sensing technology will consistently monitor and adjust the air pressure in the mattress to always match your specially chosen firmness level. The constant air pressure adjustment feature guarantees you won’t experience any back pain as a side effect, so you can easily make Serta Neverflat Air Mattress your permanent mattress that you sleep on every night. For those searching for one of the best queen air mattresses for in-home use, SoundAsleep Dream Series Air Mattress is specifically designed for indoor use so either you or your guest can get a night of thorough sleep without having to wake up to adjust the air pressure levels constantly. Since SoundAsleep Dream Series Air Mattress is only available in a Queen size, it is ideal for up to two people to comfortably sleep in as long as the combined weight doesn’t add up to more than 500 pounds. 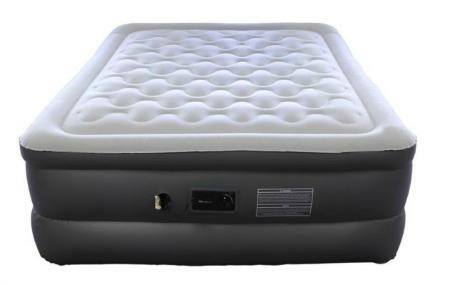 SoundAsleep Dream Series Air Mattress is the best air bed to choose from if you prefer one that is engineered to provide the particular firmness level for each user without the need to use an additional second pump. To use the built-in pump that's included with SoundAsleep Dream Series Air Mattress, all you have to do is turn the knob to the side that's labeled inflate and once it reaches your desired firmness, you can shut down the pump. This mattress will fully inflate within four minutes as well as fully deflate within four minutes. Thankfully, SoundAsleep included a carry bag that is ideal for properly storing SoundAsleep Dream Series Air Mattress, so it doesn't undergo any damages. To make a mattress comparison, the patented motor included with SoundAsleep Dream Series Air Mattress will function at a 20% quieter level than any of the previously reviewed air beds, so going to bed becomes synonymous with a peaceful environment. In regards to durability, SoundAsleep Dream Series Air Mattress comes with patented ComfortCoil Technology that consists of 40 air coils which function to prevent sagging and loss of air pressure, so sleeping on this air bed becomes an entirely comfortable experience. The typical air bed size people tend to prefer is a queen since most manufacturers don't produce an air bed that's a larger size than a queen, but Fox Air Beds is the one manufacturer that has gone the lengths to design an actual King Size Air Bed. 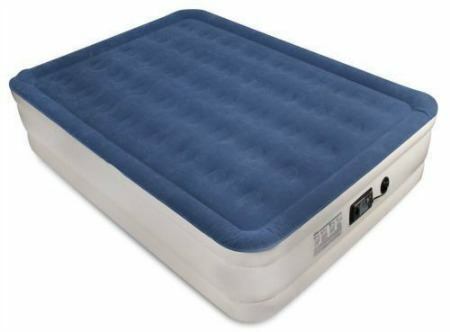 For those looking for the best camping air mattress that comes in a King size, you’ll realize that out of all the reviewed air beds Fox Air Beds Inflatable Bed should be your go-to option. If you're going on a family camping trip, Fox Air Beds Inflatable Bed will easily fit into a family-sized tent, so you can sleep in luxury while you're out in the wild. You can even set this air mattress to be the permanent bed in your guest room, and your guests won't even know the difference between Fox Air Beds Inflatable Bed and an expensive memory foam mattress. Fox Air Beds Inflatable Bed is a camper’s ultimate air mattress since unlike most air beds, this one comes with a built-in pump that can also be inflated with an external pump. This means you don’t have to be near electricity to inflate Fox Air Beds Inflatable Bed, which not a lot of competing air beds offer this feature. With Fox Air Beds Inflatable Bed, you can utilize your foot or a battery-powered pump as an external backup pump in case you experience any power outages, or you're on a camping trip, and there's no electricity nearby. In regards to inflating and deflating Fox Air Beds Inflatable Bed, it'll take you around four and a half minutes to fully inflate, which is longer than the previously mentioned air mattresses. Keep in mind that Fox Air Beds Inflatable Bed is a king sized mattress, so it's guaranteed to take a longer time to inflate fully. If you’re looking for an air mattress that guarantees durability, comfort, as well as easy storage, Air Mattress has been in the mattress industry for over 12 years dedicating its time to designing air beds that provide all three of your desired air mattress features in one King size Inflatable Bed. Air Mattress Inflatable Bed has numerous buyers claiming that they no longer experience any back and hip pains, which is rare for an air mattress to achieve. In fact, it's not common for air beds to alleviate any body pain, so for a fraction of the price of a traditional mattress, Air Mattress Inflatable Bed will work wonders on your body while you're sleeping. Out of all the air mattresses reviewed above, Air Mattress Inflatable Bed is the only one to mimic the aesthetics of a traditional mattress truly. This air bed comes with a fitted top sheet as well as a bed skirt that makes a fashion statement, which isn't typically seen on a standard air bed. In fact, the bed skirt along with the top sheet function to provide a pivotal layer separating you from the bed, which is guaranteed to keep your body temperature at a consistent warm level, so you experience extremely deep sleep. 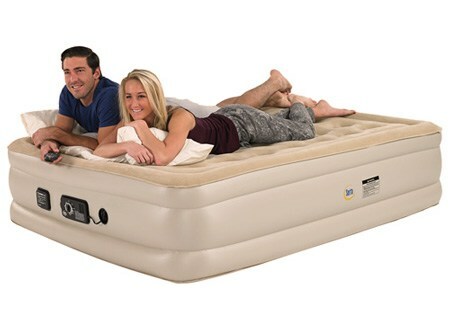 On top of having a built-in pump, Air Mattress Inflatable Bed also has an alternate pinch valve that works to pump air into the mattress without the use of electricity. Keep in mind that Air Mattress Inflatable Bed weighs heavier than the previously reviewed king size air mattress, so it’s not recommended to take it with you on a camping trip even though it also has an external pump feature as well. If you aren’t satisfied with any of the air beds discussed above, you can take a look at Intex Queen Air Mattress or Coleman Air Mattress for more options. The Intex Air Bed that was labeled the Best Inflatable Bed Winner doesn’t come in a queen size, so Intex Queen 2-in-1 Guest Airbed should be an ideal alternative. Coleman is a popular air bed manufacturer that you should check out if you didn’t like any of the air beds reviewed above. The recommended online retailer to order an air mattress Amazon has got you covered. In fact, Amazon offers some discounts off these air beds original price, so no air mattress reviewed here should cost you more than $200. Hopefully, you now have a better idea of what type of air mattress you need for your home and have narrowed done your search to a handful of air beds rather than hundreds of them. The winner for Overall Best Inflatable Bed would be Intex Inflatable Bed, while the winner for Best King Size Inflatable Bed would be Fox Air Beds Inflatable Bed. In the end, the mattress size you need along with where you'll be using it should dictate your final decision.